This is another one of those stories that I some how missed out on when it first came out. I watched the movie last year when I found it at the library and thought that I wanted to try the series. I had hoped that my niece and nephew would read it as well so we could talk about it, but they never showed much interest. My niece said she tried it, but didn't like it. She is, however, loving Rick Riordan's other series The Kane Chronicles. Like many books that I want to read for myself, I just couldn't find the time to squeeze them it (there are a number of books in this series). Last week when I was checking my status for Mockingjay, it hit me that I should check the digital library for an audio copy. They had it and the waiting list was short. 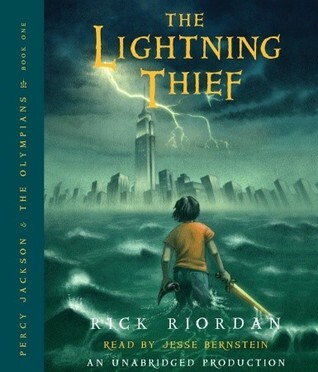 While I don't really care much for Greek mythology, I really enjoyed The Lightning Thief. The mythology stuff was kind of in the background (like magic is in the background of Harry Potter). And when a story is needed Percy is able to provide it in a way that doesn't feel like everyone but the reader knows the answer (and as I've stated before I prefer fantasy when I'm not the only outsider). Jessie Bernstein does a wonderful job at the narration and capturing the different voices. The Lightning Thief was a fun, easy listen and I'm looking forward to listening to the rest of the series (I've already reserved The Sea of Monster). I just listened to this as a reread. I've must have seen the movie too many times, because my brain just wouldn't get over that it wasn't Logan Lerman that I was listening to. Narrator was good, but I don't know if I'd hunt down books just because he narrated them. This is a series, where even if you picked up the printed books, you'd be surprised how fast you could get through them.